The Central Trade Unions have called the 2-day nationwide strike alleging anti-worker strike policies of the Central government, demanding minimum wages, social security schemes & against privatisation of public and government sector. Following the 48-hours strike, clashes have been reported from several parts of the country, including West Bengal, Kerala etc. Several trains services have been disrupted, roads have been blocked following the strike. Violence has been reported in Kolkata, Asansol and Hooghly districts in West Bengal. A school bus was vandalised in Barasat, around 30 kilometres from Kolkata. 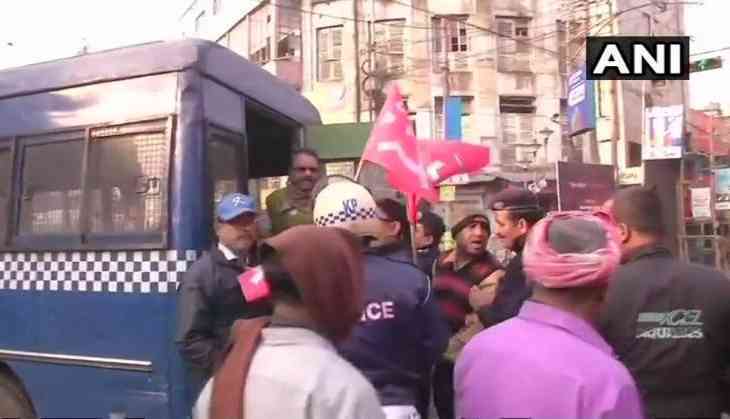 The clash between TMC and CPM workers in Asansol during 48-hour nationwide strike. While, in Odisha, the trade union CTU members protested and blocked roads in Bhubaneswar. While Train traffic was also hit in several parts of Kerala where protesters sat on the railway tracks and raised slogans. In Mumbai, 40 extra buses being run by state transport department in the view of an indefinite strike by BEST(Brihanmumbai Electricity Supply&Transport) over demands of implementation of the merger of the BEST budget with a principal budget of the BMC, employee service residences etc. Over 20 crore workers of the central trade unions are participating in the two-day nationwide strike today and tomorrow, said Amarjeet Kaur general secretary of All India Trade Union Congress (AITUC). "As many as 10 CTUs have joined hands...this is the largest number of workers from formal and informal sectors joining the strike against anti-worker policies of the BJP-led central government," Amarjeet Kaur said on Monday.